It looks like the Houston Texans have found their new backup for Deshaun Watson. The Texans reached a one-year, $3 million agreement with former Oakland Raiders quarterback A.J. McCarron on Tuesday, according to the Houston Chronicle’s John McClain. McCarron will join his fourth team in the last two years, most recently working as Derek Carr’s backup in Oakland. Previously, McCarron spent four seasons with the Cincinnati Bengals, then signed a two-year, $10 million last offseason with the Buffalo Bills to supposedly start for the team. Preseason struggles and Josh Allen’s emergence led to the Bills trading McCarron to the Raiders for a fifth-round pick instead. 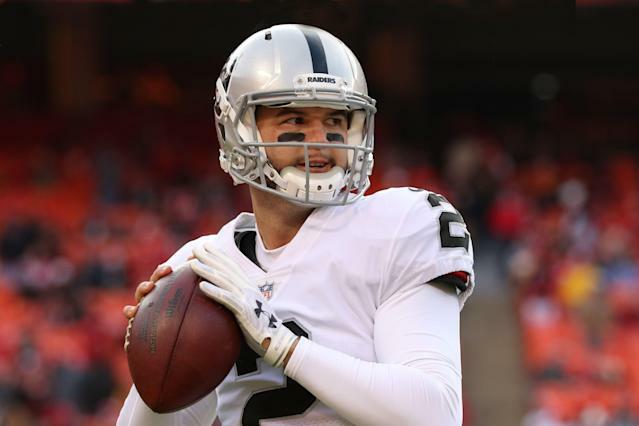 After a 2018 season in which McCarron appeared in two games and threw three passes, the Raiders opted to cut the veteran and save $5 million in cap space. Over his career, McCarron has completed 87-of-136 passes for 928 yards with six touchdowns and two interceptions. McCarron’s value was high enough at one point that the Cleveland Browns once tried to trade a second- and third-round pick for him, but they infamously bungled the trade call. Now, McCarron joins a Texans team that hopes it sees him used sparingly during games. Watson has an injury history due to his torn ACL during his rookie year in 2017, but he played all 16 games last year while making his first career Pro Bowl.